ECOTECH prides itself on providing career development opportunities for its team members, nurturing young talent and investing in their growth within the company. With its cadetship program, ECOTECH lays the foundation for up-and-coming engineers to learn about the industry and develop skills while being mentored by senior staff. James Merry with his parents at his graduation. Two of ECOTECH’s rising stars recently graduated with engineering degrees from their respective universities after working with the company since they were in high school. James Merry joined ECOTECH in 2010 after accepting a cadetship which encouraged him to study while working part time. Beginning in Year 12, James successfully balanced his final year of high school with TAFE courses and many hours learning the ropes at ECOTECH. When he enrolled in a Bachelor of Mechanical Engineering degree at Swinburne University, James continued working one day a week and during semester breaks at ECOTECH, moving from the Production department to Systems and then Research and Development. Early on, James identified his niche in production and in 2013 was offered a permanent position as production engineer, with more responsibility and a steady salary that made completing the remainder of his degree on a part-time basis that much easier. “The welcoming culture of the organisation, with the feeling of being part of a family, has made this experience a really positive one,” said James. “The hands-on experience I have gained and the personal mentorship of managers like Viral Chitroda have been invaluable in my career development and I feel extremely fortunate to have had ECOTECH’s support throughout my studies,” he added. David Mimery with his mother at his graduation. David Mimery also began with ECOTECH during Year 12, in 2012. The flexibility of the cadetship program made it possible to balance his hours at ECOTECH with his studies and working part-time at a second job. He credits managers like Viral Chitroda, Mark Staples and James Agius for personally guiding him through the transition of study to work and introducing him to the engineering industry. For David the most appealing part of the cadetship was being able to rotate through various departments to get real insight into the way ECOTECH operates – from Production to Testing, Systems, Service, and Research and Development. 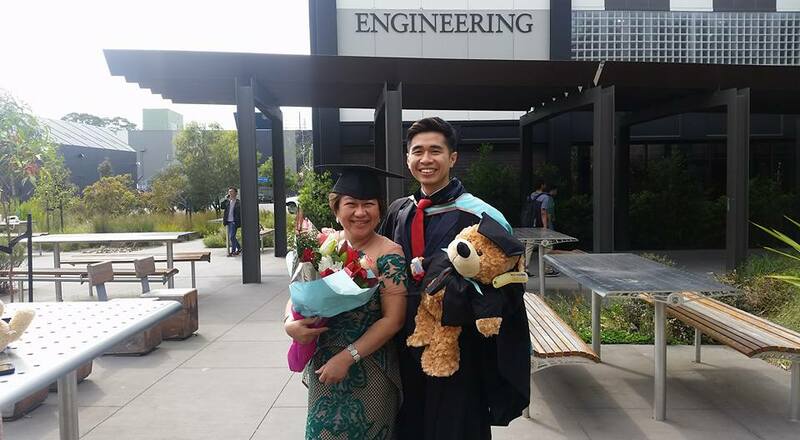 Like his colleague James Merry, David also gained a permanent role as a production engineer prior to graduating with a Bachelor of Mechatronics Engineering from Monash University. 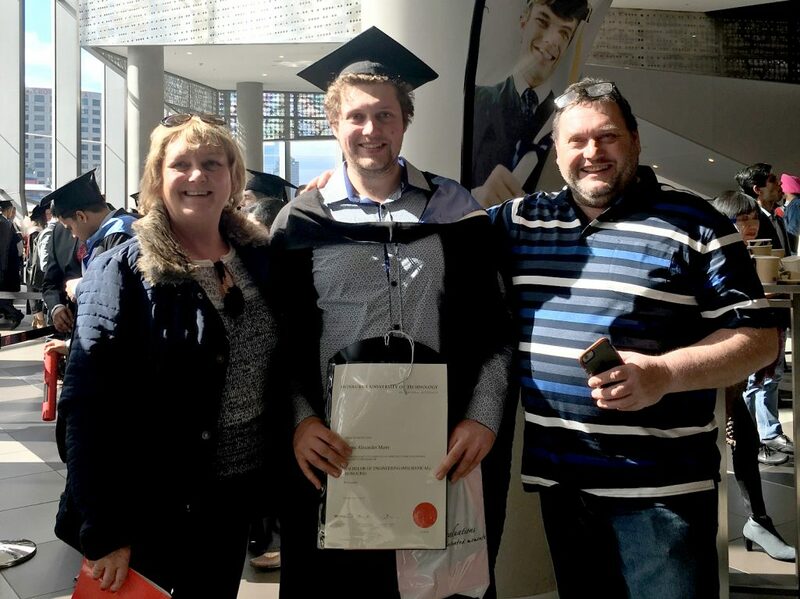 He credits the incredible support he received from his mentors, and the resources that he had access to for his to success in completing his degree. “Being immersed in both the technical and business sides of the organisation was eye-opening for me,” he commented. “From working on highly technical projects to servicing customers and giving back to the community, I have seen how this company has adapted, grown and evolved, which makes me extremely optimistic about the future and my career at ECOTECH,” he added. If you are interested in a career at ECOTECH, keep a close eye on the Careers section of our website for new opportunities.